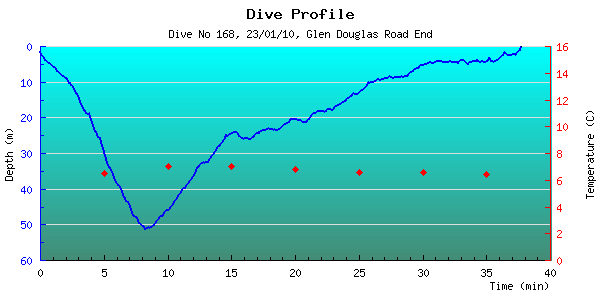 Description: This was my first dive at GDRE and we couldn't have had a better morning for it. Just before we entered the water we spotted a seal lazily swimming along the surface, unfortunately we didn't run into her during the dive. Site has characteristics of The Caves and the A-Frames in it's topography but the quantity of sea-life we saw wasn't as great as at these other sites. I did spot a little cuttlefish during our return up the wall and we saw a cod and what William claimed was a conger (though I didn't get a good look at it). After stowing away my kit I returned to the shore and took some photos and although the seal broke the surface on a few occasions I never got a shot of her. Popped into The Pit Stop in Arrochar to warm up on the way home (broth was good).